Instructions on TS School Final Results Declaration, Providing MDM Cumulative records issuing to Children, Certain instructions on the declaration of results and issue cumulative records to the Children and and convene parents meeting, text books distribution. C and DSE has clarified that the SA2 examinations have been commenced from 7th March 2017 onwards and continues up to 16th March 2017 followed by Paper correction and Distribution of answer scripts to the children and Discussion of the students answers in the class rooms, and Sending answer scripts to the parents and getting back etc., during 15th to 20th March and all the days from 15th to 20th are working days. The Mid Day Meal need to be provided as usual to the students. Subject: School Education - Certain instructions on the declaration of results and issue cumulative records to the children and convene parents meeting on 20.03.2017 - Reg. All the RJDSEs and DEOs are hereby informed that vide ref. cited instructions have been issued on half day. schools, implementation of academic calendar for the year 2017-18, text books distribution etc. In this regard vide ref. cited it was requested for to give clarification whether to provide Mid Day Meals to the students from 17th to 20th March, 2017.
during 15th to 20th March and all the days from 15th to 20th are working days. The Mid Day Meal need to be provided as usual to the students. The DEOs are directed to take serious action on Headmasters who declares holidays for children from 15th to 20th March 2017 in the name of correction of answers scripts and not providing Mid Day Meals to children. 6. 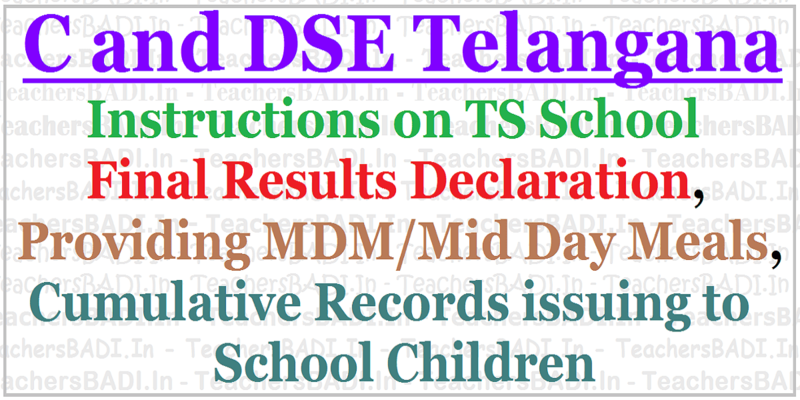 TS Schools "School - Class Readiness Programme"
7. TS Schools "Class Readiness Program"
8. TS Schools "School Readiness Program"
Subject: School Education – Certain instructions on the declaration of results and issue cumulative records to the children and convene parents meetings on 20.03.2017 – orders issued – Reg. All the Mandal Educational Officers in the district are hereby informed that in the reference cited the Commissioner & Director of School Education, Telangana, Hyderabad has informed that SA2 examinations have been commenced from 7th March, 2017 onwards and continues up to 16th March 2017 followed by paper correction and distribution of answer scripts to the children and discussion of the students answers in the class rooms, and sending answer scripts to the parents and getting back etc., during 15th to 20th March and all the days from 15th to 20th are working days. The Mid Day Meal need to be provided as usual to the students and informed that necessary action will be taken against the Head Masters who declares holidays from 15th to 20th March in the name of correction of answers scripts and if not providing Mid Day Meals to the children. While enclosing a copy of the same all the Mandal Educational Officers requested to communicate a copy of the same to the all the Head Master of PS, UPS & High School under Govt. ZP and Aided schools and adhere the instructions contained in the orders of the Commissioner & Director of School Education, Telangana, Hyderabad and any deviation in obeying the instructions action will be taken as per CCA rules. The receipt of these proceedings shall be acknowledged forthwith.